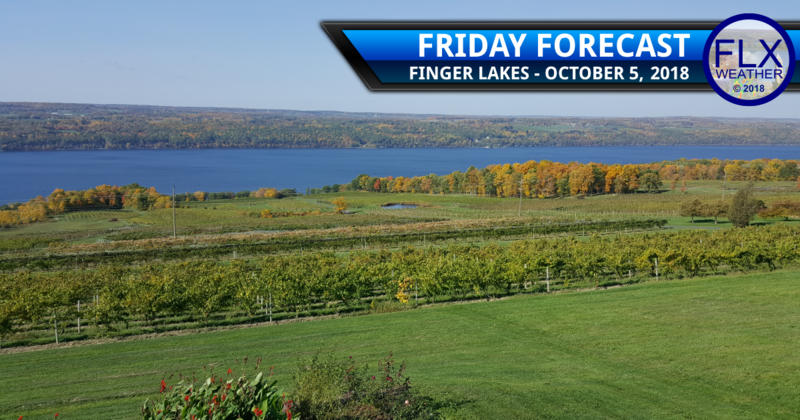 Clear skies overnight in the wake of Thursday’s cold front has the Finger Lakes off to a chilly start this morning. Most areas are well down into the 40s with a few upper 30s dotting the area as well. Temperatures should get back into the 50s by midday with highs today within a couple degrees of 60 degrees. The Southern Tier will be warmest while the shore of Lake Ontario will be coolest. Skies will start out clear and sunny. Some thin cirrus clouds will work in for the second half of the day, but it should still be sunny out. Winds will be from the north and northeast today. Many areas will see nearly calm winds this afternoon. By this evening, the wind will swing around to the southeast and pick up into a light breeze. Temperatures will slip back into the 50s early in the evening, but will cease to drop as the south wind takes hold. A slight increase in temperature is likely after midnight with upper 50s and even low 60s early Saturday morning. The forecast details for the weekend continue to evolve. As is often the case with such setups, even subtle changes in the overall pattern can have big impacts on the forecast. Saturday’s forecast remains warm. The south wind will continue to increase Saturday morning, transporting more warm air into the region. At least partial sunshine is expected, though there will likely be some periods of the day that are rather cloudy. A stray shower cannot be ruled out, especially in the early afternoon. High temperatures should still reach the mid and upper 70s all across the region. A band of showers and thunderstorms is now expected to drop southeast into the area Saturday night ahead of a push of cooler air. Clouds and a few spotty showers will linger into Sunday morning and possibly the afternoon. At sunrise, temperatures will be falling into the 50s across the northern counties while 60s hold on over the south. Temperatures should drop through midday, then hold steady, with 50s now expected for much of the region. Of course, if the front does not make as much progress southward, it will mean more 60s and even 70s. It also remains possible that a 20-degree difference in temperature will set up between northern and southern areas. Regardless of how Sunday turns out, the warm air will surge back north and remain in place through the end of next week. Daily highs in the 70s will be commonplace with a few 80s possible. A quick turn around is expected by next weekend, with current projections showing low 50s for highs consistently from next weekend and beyond.